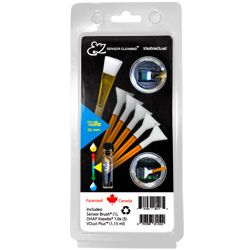 EZ sensor cleaning VDust Plus multi ingradient, Iso alcoholic solution, removes oil fast, evaporates fast, excellent for cleaning mirror with DHAP orange swab, streak free motion, best used with DHAP Orange swab excellent to be used on fluorine coated sensor. Orange DHAP Vswab patented V shape results best maneuverability inside chamber, used in high end industrial optic cleaning such as space optical lenses, woven fabric prevents scratches, holds liquid the best, thin and extremely soft, only compatible with VDust Plus solution, streak free motion of the swab is due to its patented Vshape, reaches the corner best, excellent for mirror cleaning when used with VDust Plus, not compatible with sensor clean or smear away. VisibleDust highly recommends for cameras without low pass filter to use orange DHAP Vswabs® with Vdust Plus™ instead of Green MXD100.